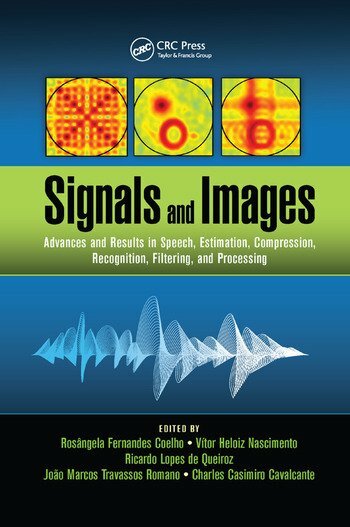 Signals and Images: Advances and Results in Speech, Estimation, Compression, Recognition, Filtering, and Processing cohesively combines contributions from field experts to deliver a comprehensive account of the latest developments in signal processing. These experts detail the results of their research related to audio and speech enhancement, acoustic image estimation, video compression, biometric recognition, hyperspectral image analysis, tensor decomposition with applications in communications, adaptive sparse-interpolated filtering, signal processing for power line communications, bio-inspired signal processing, seismic data processing, arithmetic transforms for spectrum computation, particle filtering in cooperative networks, three-dimensional television, and more. This book not only shows how signal processing theory is applied in current and emerging technologies, but also demonstrates how to tackle key problems such as how to enhance speech in the time domain, improve audio quality, and meet the desired electrical consumption target for controlling carbon emissions. Signals and Images: Advances and Results in Speech, Estimation, Compression, Recognition, Filtering, and Processing serves as a guide to the next generation of signal processing solutions for speech and video coding, hearing aid devices, big data processing, smartphones, smart digital communications, acoustic sensors, and beyond. Rosângela Fernandes Coelho holds a Ph.D degree from the École Nationale Supérieure des Télécommunications (ENST-Télécom ParisTech), and an M.Sc degree from the Pontifical Catholic University of Rio de Janeiro (PUC-Rio), Brazil, both in electrical engineering. She joined the Military Institute of Engineering (IME) of Rio de Janeiro in 2002, and is currently an associate professor in the Electrical Engineering Department. Prof. Coelho founded and heads the Laboratory of Acoustic Signal Processing (LASP) at IME. In 2003, she received the University Research Program grant award from CISCO/USA. She served as an editorial board member of the IEEE Communications Surveys and Tutorials from 1999 to 2007. Since 2008, she has been responsible for the International Scientific Collaboration IME-ParisTech. Prof. Coelho holds a US patent of an automatic speaker recognition method based on a new speech feature and a stochastic model for speaker classification. Prof. Coelho was president-adjoint of the Brazilian Telecommunications Society, an IEEE Sister Society, from 2008 to 2010. She is also member of the IEEE Signal Processing Society (IEEE-SPS). Vítor Heloiz Nascimento holds a Ph.D from the University of California, Los Angeles, USA, and an M.Sc and B.Sc from the Escola Politécnica, University of São Paulo (USP), Brazil. From 1990 to 1994, he was a lecturer at USP. In 1999, he joined the faculty, and is now an associate professor. He also serves as area editor for the Journal of Communication and Information Systems. After receiving the 2002 IEEE Signal Processing Society Best Paper Award, Professor Nascimento served as an associate editor for the IEEE Signal Processing Letters from 2003 to 2005, for the IEEE Transactions on Signal Processing from 2005 to 2008, and for the EURASIP Journal on Advances in Signal Processing from 2006 to 2009. He was a member of the IEEE Signal Processing Society (IEEE-SPS) Signal Processing Theory and Methods Technical Committee from 2007 to 2012, chair of the São Paulo IEEE-SPS Chapter from 2010 to 2014, and a technical coordinator of the 2014 International Telecommunications Symposium, organized by the Brazilian Telecommunications Society. Ricardo Lopes de Queiroz holds a Ph.D from the University of Texas at Arlington, USA. He has been a professor titular in the Computer Science Department at the University of Brasilia, Brazil, since 2009. Prior to that, he was a professor in the Electrical Engineering Department at the same university; a member of the Research Staff at Xerox Corporation, Webster, New York, USA; and an adjunct faculty member at the Rochester Institute of Technology, Rochester, New York, USA. He is spending the year 2015 as a visiting professor at the University of Washington, Seattle, Washington, USA. Dr. de Queiroz is a senior member of IEEE and a member of the Brazilian Telecommunications Society. Widely published and highly cited, he has been an editor of numerous journals and publications, as well as an integral part of various technical and organizing committees. He also holds 46 patents. João Marcos Travassos Romano holds a Ph.D from the University of Paris-XI, France, and an M.Sc and B.Sc from the University of Campinas (UNICAMP), Brazil. In 1988, he joined the School of Electrical and Computer Engineering (FEEC) at UNICAMP, where he is now a professor and the head of the Signal Processing for Communications Laboratory. Professor Romano has served as an invited professor at the University René Descartes, Paris France; Conservatoire National des Arts et Métiers, Paris, France; and École Normale Supérieure, Cachan, France, as well as the vice-director of the School of FEEC at UNICAMP, the president of the Brazilian Communications Society (SBrT), and the editor-in-chief of the IEEE/SBrT Journal of Communications and Information Systems. He is a senior member of IEEE, an emeritus member of SBrT, and a recipient of the Zeferino Vaz Academic Achievements Prize (UNICAMP, 2008) and the 25 Years of the Brazilian Telecommunication Society Prize (SBrT, 2008) for research and teaching contributions in his field. Since April 2015, Professor Romano has been the dean of the School of Electrical and Computer Engineering at UNICAMP. Charles Casimiro Cavalcante holds a Ph.D from the University of Campinas, Brazil, and an M.Sc and B.Sc from the Federal University of Ceará (UFC), Fortaleza, Brazil. From March 2007 to November 2008, he was a visiting professor in the Teleinformatics Engineering Department of UFC. He has been an assistant professor in the same department since November 2008, and holds the statistical signal processing chair. In addition, he is a researcher in the Wireless Telecommunications Research Group (GTEL) at UFC, and a senior member of both IEEE and the Brazilian Telecommunications Society. From August 2014 to July 2015, he was also a visiting assistant professor in the Department of Computer Science and Electrical Engineering at the University of Maryland, Baltimore County, USA. He was also vice-president of the Brazilian Telecommunications Society for two terms, and an integral part of various technical and organizing committees. "In today's society, signal processing serves as the core component for many ubiquitous technologies essential to our everyday lives, including smartphones, digital cameras, wearable devices, IMAX 3D movies, and HD TVs. The authors present a wonderfully informative investigation into the theory and methods underlying such technologies, particularly in acoustic signal processing, image processing, signal processing in communications, and various other vital signal processing topics. Despite the rapidly changing nature of signal processing, the authors present the perfect, expert guide for undergraduate and graduates students, researchers, and practitioners to understand and develop the next generation of crucial emerging signal processing technologies." "… covers some of the most significant recent advances in signal processing, including methods and applications. Chapters are written in a tutorial style and are ideal both for researchers of the field or close fields who want to get a deeper insight into the covered materials and for early-stage researchers who need to obtain a global overview of signal processing problems to define their own interests." "… aids the reader in getting acquainted with many subjects of high interest in a fast and convenient manner. Written by experts in the covered fields, the book is a very valuable addition to the literature."